What’s your style: good or evil? If you could train up as a fairytale character, who would you be? Every four years, two girls are kidnapped from the village of Gavaldon. 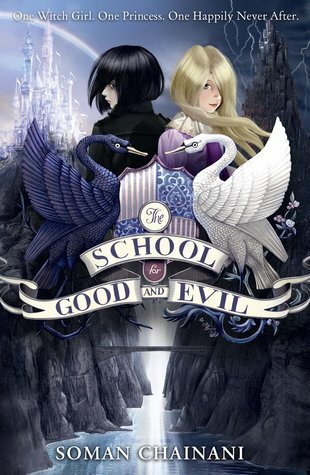 Snatched away to the School for Good and Evil, where fairytale heroes and villains are trained. Beautiful Sophie dreams of being a storybook princess. She has the long golden hair, the glass slippers, the devotion to good deeds. Meanwhile, her best friend Agatha seems perfect for the School of Evil. Her dark disposition, black frocks and spitting cat are perfect for a wicked witch. But when these two are kidnapped, they find their fortunes reversed. Every decent fairytale has a twist… Wry, witty, magical: a New York Times bestselling sensation. Surrender to the enchantment and see how this story unfolds. This is my favourite book.This book is amazing and I loved it.I read it again and again,but I never get bored! I was really excited when this book came out and immediatley I reserved it from the library.when I got it I immediatley read it. After 30 minutes or so I felt that this could not be right because the girls at the school for good were snobs!!! That’s right…. Snobs! Near the beginning it said that the school for good taught girls to be kind but they are so mean! The idea for this book was fantastic but I don’t think the book is well written. There could be loads of other possibilities with the book but the author didn’t execute her idea correctly. Personly, I think I would recommend this book to others because its really good x Sophie and Agatha are the main characters in the story .